Frank Sinclair was still an outsider looking in on the thankless, sometimes murky world of football management when he bumped into Chelsea boss Jose Mourinho at Leicester on Monday night. The ex-Chelsea and Leicester defender, 44, was there in a media role to comment on two of his former clubs. But inside 72 hours, he became manager at non-league Hednesford, and Mourinho was out of a job. "Good job I got in at Hednesford before he became available," smiled Sinclair. "I had a quick chat with Jose at Leicester and he didn't look his usual flamboyant self, but Chelsea have not been playing well and, as always, it's the manager who pays with his job." The much-travelled Sinclair admitted his opportunity with the Pitmen, who wanted him to replace Bernard McNally, sacked after just 11 games in his second spell in charge, was unexpected. 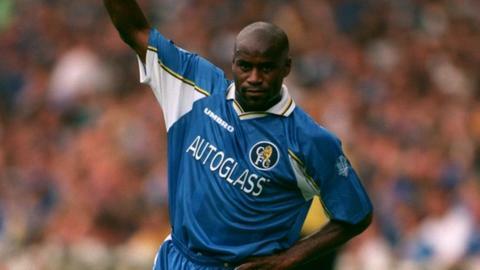 Frank Sinclair played 522 league games over 20 seasons, spent mostly with Chelsea and Leicester City. He also spent three years at Burnley, playing for Huddersfield Town, Lincoln City, Wycombe and Wrexham. He carried on playing non-league football at Wrexham, Hendon and Colwyn Bay, where he became player-manager - and recently made 13 appearances for Brackley. "It happened very quickly. I got a call Tuesday morning from the chairman, met him at one o'clock in the afternoon and by around 4pm I was put in place as the new manager but that's football," he told BBC WM. "I'm certainly prepared for it. I've wanted to get back into football since my last job at Colwyn Bay, which was roughly a year ago. "I've had a chance to work on the stuff went I thought went really well and didn't go so well. Then I had the opportunity to work at Brackley as interim manager fairly recently too, so I'm going to put those experiences together and use them to try and improve the club's fortunes." Sinclair takes over with Hednesford 18th in the Northern League North table, just a point clear of danger, going into the festive period. They will twice take on their West Midland relegation rivals, bottom club AFC Telford United, who are managed by former Hednesford boss Rob Smith, and left the club to return to the Bucks Head in August. Hednesford then host the Bucks on Boxing Day, a daunting first home game in charge for Sinclair after this Saturday's trip to mid-table Stalybridge, but he hopes his experience at Colwyn Bay, who he saved from relegation from the same division, will help. "It's a similar scenario," he admitted, "because of the position we're in. I'm going be working with a group of players, who might be underperforming, lacking a bit of confidence and needing someone to lead them out of it. But that's what I'm here to do, slowly getting to learn about the players. "We've got a tough game coming up on Saturday away at Stalybridge, but it's a good test and I'm learn a lot about my group of players and we've got to try and put points on the board as soon as possible." Frank Sinclair was talking to BBC WM's Steve Hermon.